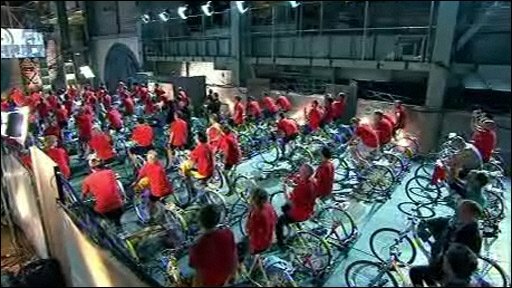 BBC News - Can 80 cyclists power a house for a day? Can 80 cyclists power a house for a day? How much electricity does the average British family of four use in a day? To find out, BBC's Bang Goes the Theory attempts to power a house for an entire day solely through human pedal power, while an unsuspecting family inside go about their normal Sunday routine.